First of all, Happy National Iced Tea Month! I am personally a year-round tea drinker, but I’ll be sure to “sacrifice” and drink some extra tea throughout the rest of the month. According to the Tea Association of the USA, Inc., tea is nearly 5,000 years old. It was discovered in 2737BC. Iced tea is just a tad bit younger – it’s 106 years old as of June 1st! 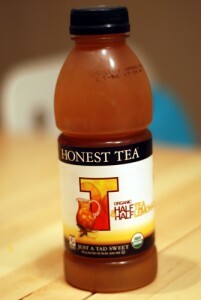 In honor of iced tea’s birthday, I recently received some Honest Tea Half & Half (half tea, half lemonade) to review. I have to be honest – I’ve never been a fan of bottled tea. ; for me it’s always been fresh brewed or nothing. Until now. Honest Tea has a fresh taste that I’ve never found in a bottled tea before, and I’m pretty sure the ingredients (or lack thereof) have something to do with it. This tea has just six ingredients, all of which I can actually pronounce and know what they are: purified water, organic cane sugar, Fair Trade Certified organic black tea, organic lemon juice concentrate, organic lemon extract, and citric acid. I love that the tea they use is Fair Trade Certified, so you can feel good about drinking it. I received two bottles for review and decided to have my family sample it too. Everyone agreed that the lemon and tea flavors are well balanced – you get a nice blend of both flavors when you take a drink. Would you like to taste this for yourself? Well guess what – you can! THREE readers will win two bottles of Honest Tea to try. Perfect timing with the heat of summer upon us, isn’t it? 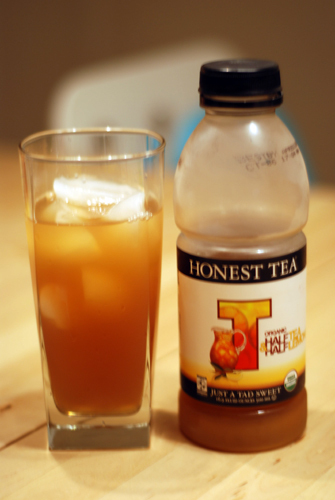 Honest Tea has provided three Half & Half prize packs (with two bottles of tea) for me to use in this giveaway. This contest is open to all U.S. and Canadian residents. Entries will be accepted until midnight CST Thursday, July 1st. Mandatory entry: Comment letting me know why you love iced tea. I mean, it is National Iced Tea month! Note: This was not a paid post, and honest opinions were provided. Honest Tea provided me with samples for review and is providing the tea prize packs for the giveaway, but I was not monetarily compensated. 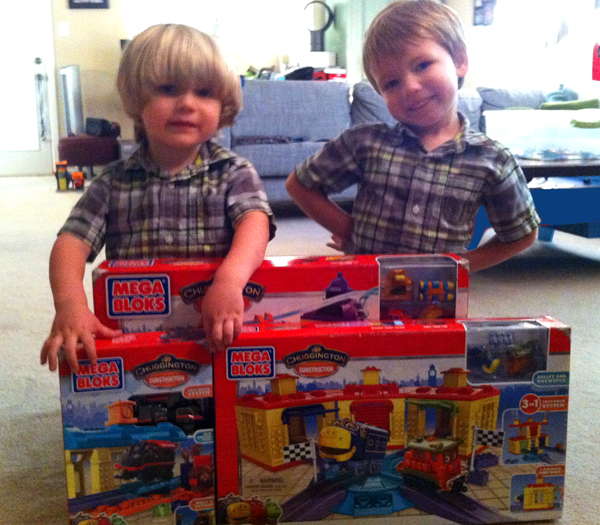 All Aboard For a great Chuggington Giveaway! I love ice tea because it’s refreshing and light! I almost always through some lemonade in my tea even at restaurants with good tea I ask them to give me a splash of lemonade. We love ice tea!